The 1969 river fire inspired the creation of the EPA and Clean Water Act. Fish caught in the Cuyahoga River, famous for catching fire in the 1960s are now safe to eat, says the Ohio Environmental Protection Agency. On Monday, the Ohio EPA announced that after consulting with federal officials, fish consumption restrictions on the Cuyahoga River, which runs from Lake Erie through northeastern Ohio, will be eased as a result of significant improvements of the water quality. It moves the Cuyahoga River one step closer to being delisted as an "Area of Concern." There are still several more issues that need to be improved until it can be delisted. (The Plain Dealer via AP) A fire tug fights flames on the Cuyahoga River near downtown Cleveland, where oil and other industrial wastes caught fire June 25, 1952. Ohio Gov. Mike DeWine praised the announcement, which came on the heels of his H2OHIO Initiative, which promises to create a fund that will spend approximately $900 million dollars over 10 years on protecting Ohio’s water quality. “This is an example of the progress that can be achieved when you collaborate and dedicate resources to improving the quality of water in our state,” he said in the statement. On June 22, 1969, a fire broke out along the Cuyahoga River that was caused by oil and pollution of the river by nearby industrial factories. It was a relatively local issue when it occurred, but when Time Magazine published an article later that year about the fire it became a symbol of the impact of pollution on the nation's waterways. 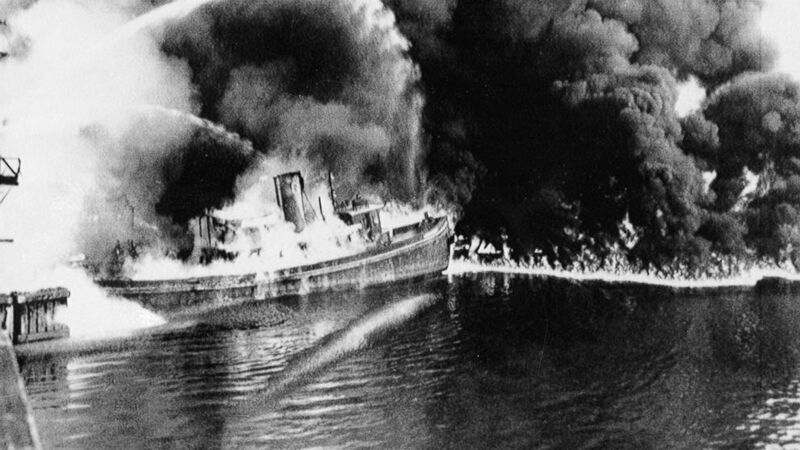 The picture that Time ran, which actually showed an image of an earlier fire on the Cuyahoga in 1952, captured the attention of the national public. There are no known photos of the fire that occurred in 1969. Later that year Congress passed the National Environmental Policy Act which was a precursor to the development of the Environmental Protection Agency in 1973 and the passage of the Clean Water Act in 1972. The river is now home to more than forty species of fish and has not had another river fire since 1969.